This allows your customers to make a payment to you via the webportal using PayPal. This will automatically create accounting and mark invoices as paid. This will download a list of all transactions which pass through your PayPal account onto the PayPal Log in Brightpearl. 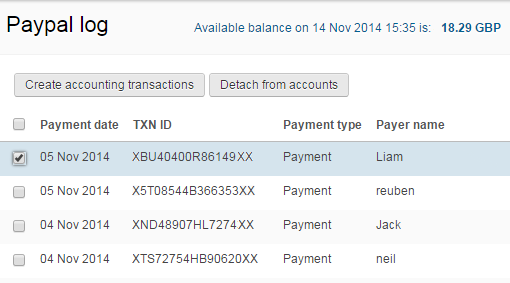 You can review the list in Brightpearl and then choose for which transactions you need to create the accounting. Note that many sales channels will already be creating payments including PayPal, so you won't necessarily need to create all of the listed transactions. You will need a PayPal Business Account. Note : While obtaining your API Credentials you are offered the choice between a certificate or a signature - please choose the signature option. Open your Brightpearl account, and turn on the PayPal app within the App Store. Click the Set Up button on the PayPal app to access the settings. Enter your PayPal credentials and save your changes. Now go to Settings > Company > Payment methods . Give the payment method the code of PAYPAL . Link the PayPal app to the payment method by selecting it from the dropdown. Select the bank account where accounting should be created for PayPal webportal transactions. PayPal can be directly integrated with Brightpearl to allow customers and suppliers to make payments through the Brightpearl web portal - available with all Brightpearl accounts. This will mark the invoice as paid in Brightpearl, update the customer/supplier account balance and create sales receipt accounting journal. PayPal offer an auto-return feature which allows you to dictate where they are redirected to once they have completed the payment. Your PayPal account can be integrated directly with Brightpearl so that you can download and view your PayPal transactions on the PayPal Log. This integration allows you to generate accounting entries directly from the downloaded transactions and to allocate payments to sales orders. However, if you are using integrated sales channels, PayPal payments made via those channels will be handled by the sales channel integration and should not be processed in this way. To find out more about handling payments from sales channels please refer to the relevant sales channel section of the support documentation. It is not possible to create new PayPal transactions from within Brightpearl using this integration, only to create the accounting in Brightpearl. However, Brightpearl also offers PayPal as a payment method for use on the web portal. Transactions will only download when the sync is manually activated from the PayPal Log. When the integration is first actived the last 3 months of transactions will be downloaded. From then on each sync will check for new transactions within the last 30 days. No transaction will download more than once. The PayPal Log is where all the transactions can be viewed and selected for processing, which will create the accounting. Access the PayPal Log via Accounting > List bank accounts . It is important that transactions relating to downloaded sales orders via integrated sales channels are not processed since this will duplicate the payment and accounting created by the sales channel integration. For any other transaction not already created in Brightpearl, the PayPal Log can be a useful way of generating the accounting entries. Select the items and click the Create accounting button. Note : This process should not be used for transactions relating to payments received via integrated sales channels. This will duplicate payments. Go to your PayPal log via Accounts > List bank accounts . Select the transaction(s) that need to be posted to accounts. Click the Create accounting transactions button. Go to Accounting > List bank accounts > View PayPal log . Find the PayPal transaction on the PayPal Log; use the filters to search by customer email or amount. Highlight and copy the PayPal TXN ID . Search for and open the sales order/invoice. Click the Allocate PayPal transaction button at the bottom of the screen. Paste in the TXN ID and click Allocate . This will simultaneously mark the order as paid, reduce the customer account balance and create the necessary accounting (SR journal). Any related fees will not automatically be created; these accounting transactions can be created from the PayPal Log. Go to your PayPal log, via Accounting > List bank accounts . Search for and select the checkbox next the transaction that has been created / matched to an order by mistake. Click the Detach from accounts button. This unlinks the accounting from the transaction. Copy the PayPal transaction ID and paste it into the QuickSearch box, select Accounting in the drop-down and then click Go to find the original accounting journal entered. Click the journal ID to view/edit. You need to cancel this journal. Enter a reason for modification then click the Cancel button. The PayPal transaction can now be processed again, as required. You will need to have activated the PayPal log at Settings > Brightpearl Apps > PayPal . Go to the PayPal log via Accounting > List bank accounts and clicking the View PayPal Log link against the PayPal bank account. Select all the transactions for which the fees need to be created. In the pop-up window check the box to transfer fee amount from PayPal account to: Note that you should not select the check box to create a bank receipt where handling payments related to sales channels since this part of the transaction will already have been created from the channel. Select the nominal code where PayPal fees should be recorded. Click the Create transactions button. A journal for each transaction will be created to debit the selected nominal code and credit the PayPal bank account.